Introduction: With the advent of clinical fellowships in general surgery, there has been a continual debate over the effect on general surgical resident training. 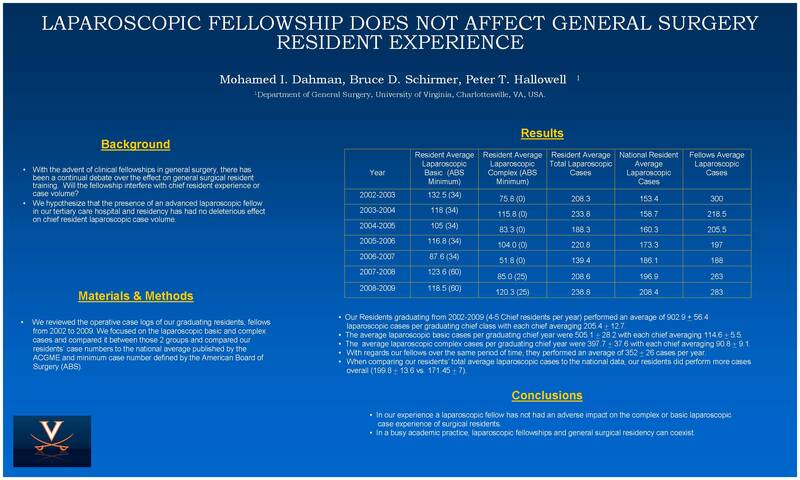 Will the fellowship interfere with chief resident experience or case volume? We hypothesize that the presence of an advanced laparoscopic fellow in our tertiary care hospital and residency has had no deleterious effect on chief resident laparoscopic case volume. Methods: We reviewed the operative case logs of our graduating residents, fellows from 2002 to 2009. We focused on the laparoscopic basic and complex cases and compared it between those 2 groups and compared our residents’ case numbers to the national average published by the ACGME and minimum case number defined by the American Board of Surgery (ABS). Results: Our Residents graduating from 2002-2009 (4-5 Chief residents per year) performed an average of 902.9 +/- 56.4 laparoscopic cases per graduating chief class with each chief averaging 205.4 +/- 12.7. The average laparoscopic basic cases per graduating chief year were 505.1 +/- 28.2 with each chief averaging 114.6 +/- 5.5. The average laparoscopic complex cases per graduating chief year were 397.7 +/- 37.6 with each chief averaging 90.8 +/- 9.1. With regards our fellows over the same period of time, they performed an average of 352 +/- 26 cases per year. When comparing our residents’ total average laparoscopic cases to the national data, our residents did perform more cases overall (199.8 +/- 13.6 vs. 171.45 +/- 7). Conclusions: In our experience a laparoscopic fellow has not had an adverse impact on the complex or basic laparoscopic case experience of surgical residents. In a busy academic practice laparoscopic fellowships and general surgical residency can coexist.